The last election of May 11, 2013 placed Pakistan on the radar as a country which in addition to Muslims is a home to seven non-Muslim communities. These are namely Hindus, Christians, Sikhs, Parsis, Bahais and Buddhists. Except for the boycott of some 200,000 members of the Ahmadi community, 1.40 million Hindus, 1.23 million Christians, 5,934 Sikhs, 3,650 Parsis, 1,452 Buddhists and 809 Jews played a crucial role in 96 constituencies. Of the seven minority communities living in the country, Hindus constitute the largest group. Elections 2018 are being held in a charged political climate. There are accusations of favouritism and micromanagement of the electoral process. Ahead of the polls, there have been several cries of pre-poll rigging. Pakistan Muslim League-Nawaz (PML-N) is questioning the fairness of the process and the manner in which justice has been administered in its cases. It is understandable that Mian Nawaz Sharif could not be the only erring politician since 1947, who allegedly parked his wealth outside the country. There is an important community comprising of five generations of persecuted people. They are designated as Kashmiri refugees living in all the provinces of Pakistan. 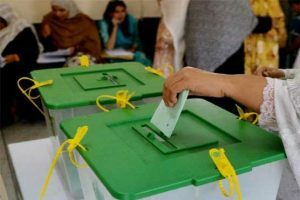 They are entitled to vote not only for the National Assembly and Provincial Assemblies of Pakistan but after the 13th amendment, they also vote for 12 seats in now a 53 member Legislative Assembly of Azad Jammu and Kashmir. These people fall under the State Subject Law of April 20, 1927. There are other Kashmiris (Pakistanis of Kashmiri origin), who left the State during the famine of 1832 and the epidemic of 1867and settled in various parts of British India. A majority of them settled in Amritsar and Lahore. These Kashmiris are entitled to vote in the UN supervised referendum. It is unfortunate that they are not listed in the electoral college of Azad Kashmir or identified for the future UN supervised referendum. At a time when India is all set to decimate the Kashmiri youth and disturb the Muslim majority character of Jammu and Kashmir, we have made the gross error of not keeping a count of people of Kashmiri origin in Azad Kashmiri’s electoral roll. We need to counter Indian efforts to bring about an unnatural demographic change by keeping a proper count of people of Kashmiri origin. So far, this threat has missed our attention. Easily identifiable families of Kashmiri origin in Pakistan are: the families of Khawaja Nazim-ud-Din — the second Governor General of Pakistan, Haji Manzoor Hussain, (1922-1985) also known as Bholu Pahalwan, Mian Amirud Din, Sheikh Masood Sadiq and Sheikh Sadiq Hasan, Javed Iqbal, Agha Hasher, the Sharifs, Ayaz Sadiq (Sheikh), Justice Badiuz Zaman Kaikaus, Khan Abdul Qayyum Khan, Kirmanis, Agha Husher, Shorish, Dar, Mir, Malik and other families living all over Pakistan. The PML-N cabinet was full of Pakistanis of Kashmiri origin. Over a crore Pakistani voters of Kashmiri origin are likely to vote in the Pakistan election 2018. A quarter of this number votes for the 12 refugee seats in the Azad Jammu and Kashmir Assembly. The merits of numerical and qualitative presence of Kashmiris in the National and Provincial politics of Pakistan are not translated in the manifestoes of the major political parties contesting the elections. The PML-N manifesto makes a passing reference to UN resolutions, aspirations of the people and 1999 Lahore Declaration to resolve the Kashmir dispute. The PML-N manifesto has committed itself to an Aadha Teetar Aadha Bater concern on Kashmir. The first part is a generic routine and the addition of 1999 Lahore Declaration, has its demerits. This declaration has disturbed the core position of Kashmir and has rendered it one of the eight outstanding issues. Pakistan Tehreek-e-Insaf’s (PTI) manifesto has included Kashmir among the four basic issues of interest. There is no other qualifying reference beyond this passing mention of the word Kashmir. Azad Jammu and Kashmir Interim Constitution (Thirteenth Amendment) Act, 2018 does not disturb the principal role of the Government of Pakistan in the affairs of Azad Kashmir and its duties assumed under UNCIP resolutions. Azad Kashmir Assembly has been duly empowered and the Azad Kashmir Government would have massive powers under Article 51-A. All this empowerment is people-specific and aimed towards better governance and securing self-determination under UN Charter and according to the UNCIP Resolutions through the democratic method of free and fair plebiscite. Pakistan keeps an exclusive control of 54 subjects listed in ‘Part-A’ and ‘Part-B’ of the Third Schedule. There would be fresh appreciation and appraisal of interaction between the Government of Pakistan and the Government of Azad Kashmir. This change and the ongoing repression in the Indian occupied Kashmir are not reflected in the manifestoes of PML-N and PTI. The General assembly session of September 2018 is around the corner. UN High Commissioner for Human Rights report on Kashmir and its endorsement by the UN Secretary General are very serious developments. It seems that PML-N and PTI have not done the proper homework on Kashmir and have addressed Kashmir simply as a matter of routine. The two parties need to revisit their narratives on this issue.